This year has absolutely flown by. Now that the holiday season is here and Christmas is upon us, have you started thinking about your Christmas dinner tablescape? A beautiful holiday themed centerpiece paired with your best China and linen napkins sounds gorgeous, don't you think? Christmas is all about decadence and if you're in the market for new table linens, it's time to turn to Crown Linen Design. Crown Linen Designs offers the finest bed, bath, table, and kitchen linens. Whether you're in the market for new linens for your table or even your bedroom, Crown Linen Designs is the linen headquarters. Turn to them for gorgeous embroidered linens in various colors and patterns that will make you smile each time you see them. With Christmas just weeks away, why not spice up your table this year with a new table runner, napkin, and placemat set? Whichever room of your home you choose to update your linens with, I can guarantee you'll be satisfied. This is my favorite table linen set from Crown Linen Designs. Your table and guests would really appreciate this for your Christmas meal. The coordinating table runner and napkins are just so beautiful and elegant. Your Christmas meal will certainly be turned up a notch if you choose the Flax Embroidered Table Runner. The best part is that you can transfer the runner onto your bed afterwards. Bring the elegance from table to bed with ease. Anything from this company would make the ultimate holiday gift for any friend or family member. If you want to give a gift that will really make a statement, Crown Linen Designs is waiting to hear from you. Looks like beautiful quality items. I LOVE table runners. I almost always have one on my kitchen table. I like the simple elegance of the linen fabric used by Crown Linen Designs. I love how you can choose from so many styles and colors. I love it's elegance! Everything is quality! 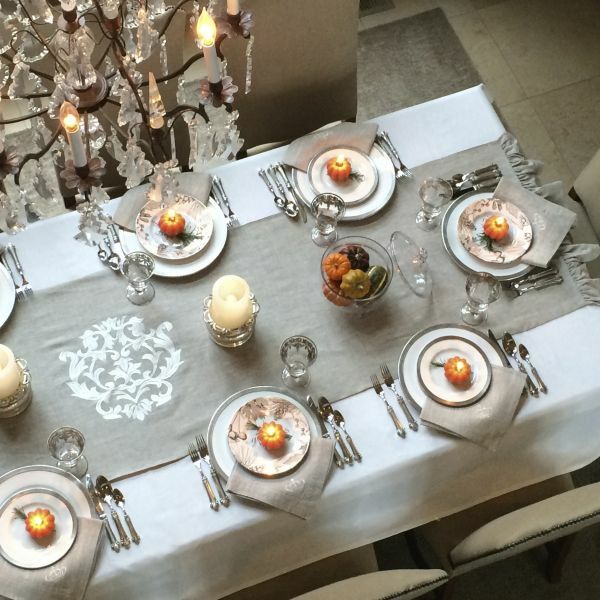 I think Crown Linens make your table look beautiful. Their designs are elegant. Such lovely linens as these are passed down through generations and are treasured by family members. I like their designs. They can make a ordinary table setting look so elegant.